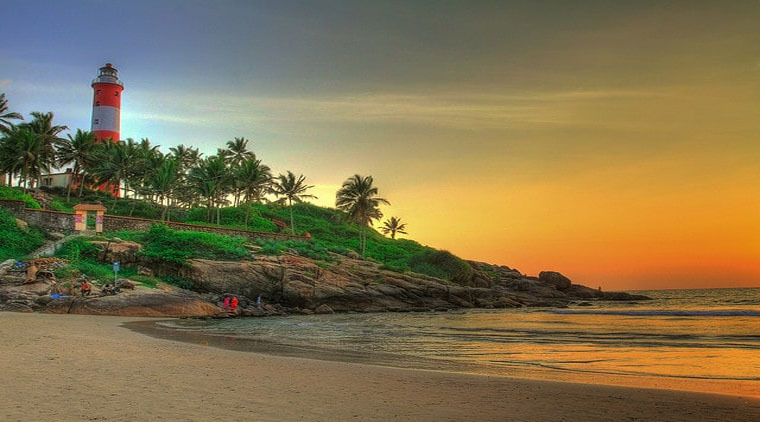 Kerala Honeymoon Tour Packages by Waytoindia.com take the newlywed couple to Kerala, the God's own country. 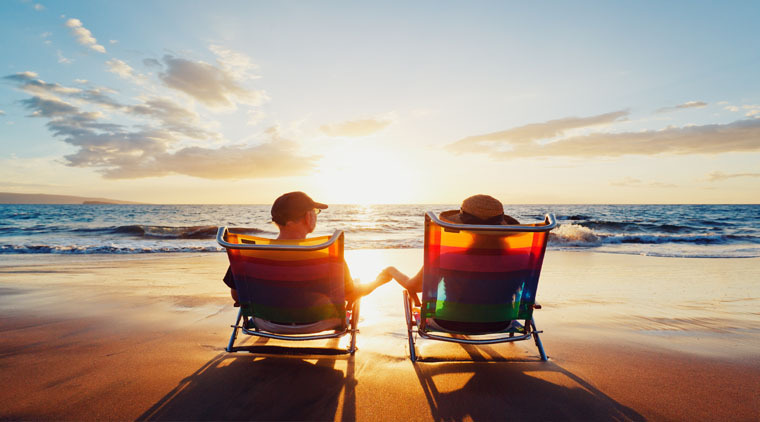 Kerala Honeymoon Tour Packages are designed in a way that the couple can spend their special moments together in the most romantic and scenic environs of Kerala. 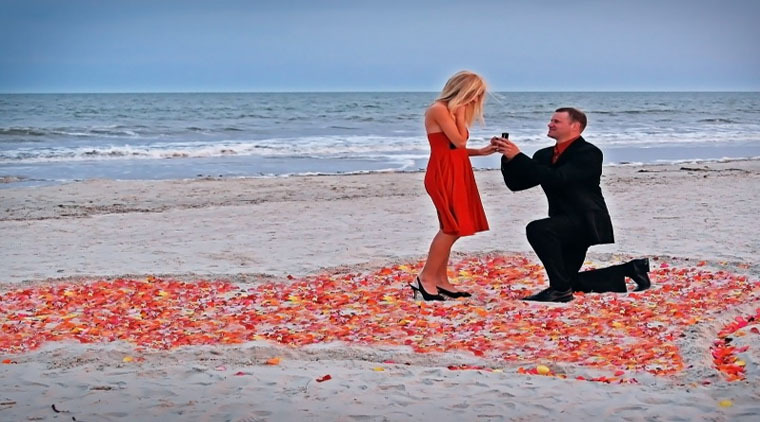 Kerala Honeymoon Tour Packages by Waytoindia.com take the newly wed couple to Kerala, the God's own country. 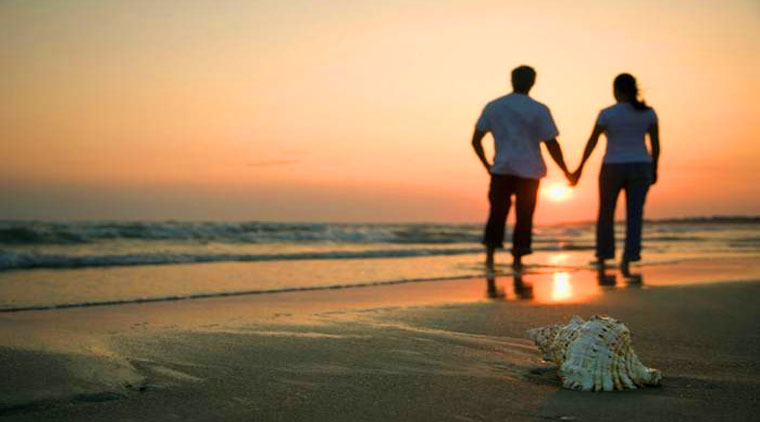 There is no doubt that Kerala is a perfect destination for honeymooners. Kerala Honeymoon Tour Packages are designed in a way that the couple can spend their special moments together in the most romantic and scenic environs of Kerala. Kerala is blessed with natural beauty, flora and fauna, mountains, backwaters, beaches, arts and culture and so on. Spend a quality time in Kerala and come close to the nature while enjoying the serenity of the region by booking Kerala Honeymoon Tour Packages. Welcome to Kerala, God’s own Country!! As you arrive at Kochi airport or Ernakulam station, our arranged vehicle would take you to your hotel. Check in at the hotel and get refreshed. Later you would be going for Kochi city tour. Kochi is located on Arabian sea and it is one of the most important and busy ports in India.This vibrant town has many things to offer, history, culture, cuisines and shopping!! In city tour of Kochi, you would be visiting Jewish Synagogue(not open on Saturdays and Jewish holidays) in Jew Town, Mattancherry Palace(not open on Fridays and public holidays). Later visit Chinese Fishing Nets, the only ones in India and St. Francis Church(not open for visitors on Sundays from 08.00 to 11.00 hrs.) the oldest European Church in India. In the evening, you can go for shopping. Kochi is famous for spices, silk and South Indian sarees and sweets also!! To see the artistic side of the town and to experience a good time, go for Kathakali dance performance at 5 pm. Proceed to Munnar after breakfast. A journey through hills and mountains takes you to hill Munnar, one of the most famous hill stations in South India. Once you arrive in Munnar, check in at the hotel. Later you can explore this beautiful town or take rest in your hotel. After taking breakfast at the hotel, go for tour of Munnar. In this tour, visit Mattupetty dam, various tourist points in Munnar, Devikulam and tea estates. If time permits, you may also visit Eravikulam National Park which is famous for endangeres Nilgiri Tahr. After taking your breakfast, proceed to Thekkady. Thekkady is known for Periyar wildlife sanctuary and spice plantations. Check in at the hotel and quickly get refreshed. Later proceed for sightseeing tour of Thekkady. Visit spice plantations around and other tourist places. You can also have a nature walk. At 6 am, proceed to visit Periyar wildlife sanctuary. Take a boat ride in lake Periyar. You can see variety of animals and birds during this enjoyable boat ride. Later come back to the hotel, have your breakfast and proceed to Kumarakom. Once you arrive at Kumarakom, check in at the hotel. Later proceed for sightseeing tour. Visit Kumarakom bird sanctuary, house boat jetty and tiny villages located on the banks of backwaters. After having breakfast, at 10.30 am, proceed to Alleppey for your houseboat stay. Upon arrival, check in at the houseboat. 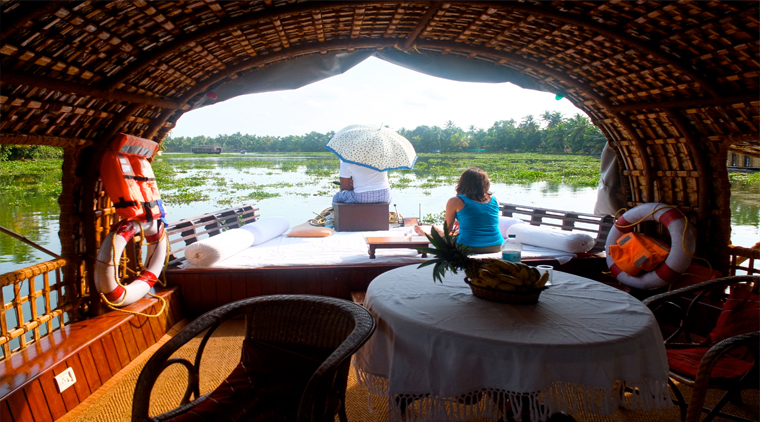 Enjoy serenity of backwaters as houseboat sails through. You can also see villages and scenic islands in the backwaters. Stay on the houseboat is really an unique experience. While enjoying the backwaters, you would have delicious cuisines on board prepared and served fresh!! It’s time to say good bye to vibrant Kerala. After having breakfast, transfer to Kochi airport or Ernakulam railway station, as per your train/flight connection. End of wonderful and memorable tour!! Stay at a resort which is backwater facing with a swimming pool.One such resort is Lemon Tree in Alleppey.Take a plunge into the swimming pool together and experience serenity at its best.Other fine resorts are Punnamada Lake Resort at Alleppey which has backwater facing luxury cottages. A romantic honeymoon cannot be enjoyed in Kerala unless there is a overnight stay in a houseboat which would cruise on Vembanad Lake.Special honeymoon supplements like candle light dinner, flower decoration etc. can also be arranged. Take a elephant ride together at Elephant Junction located at Murukkady P.O Thekkady,Kumily,Kerala.For bookings you may call +919447163342. Roam along the aroma of tea in tea plantations or spice plantations. If you can afford, do not miss a candle light dinner on the raised sea facing platform at Turtle on the Beach at Kovalam, where the sea breeze would create lasting impressions of romanticism in your lives. Carnoustie Ayurveda and Wellness Resort , Marari. Somatheeram Ayurveda Resort , Kovalam. Beach and Lake Ayurvedic Resort ,Thiruvananthapuram. Sarovaram Ayurvedic Backwater Health Centre,Kollam. Ayurveda Yoga Villa , Wayanad. If you are visiting Wayanad, you may trek upto Chembra peak where you would be amazed to see the heart shaped lake.However, please note that prior permission from the forest department may be required before trekking to Chembra Peak. Get wet together under one of the romantic waterfalls of Kerala.One such beautiful waterfall is the Athirapally falls about 70 Kms from Kochi. Dream Catcher Resort, Munnar : Ratnagiri, Tea Company Bisonvalley Road, Munnar, Idukki District, Kerala- 685565, India , Mobile No. 9745803111. Carmelia Heaven Resort, Thekaddy : Vandanmedu, Idukki, Thekkady, Kerala 685551, Contact No : 04868 270 252. Green Woods Resort, Thekkady : K.K .Road, Kumily, Thekkady, Kumily, Kerala 685509, Mobile No :094465 74383. Vythri Resort, Wayanad : NH-212, Near Vythiri Town, Vythiri P.O Wayanad – 673 576, Kerala, India.Mobile No : 9388 256 723. You may also go through many more of such exciting Kerala Tours organised by Waytoindia.com . •	Assistance on arrival at Kochi. •	All meals will be provided on the houseboat only. •	AC vehicle from Kochi to Kochi for all applicable transfers and sightseeing, inclusive of driver allowances, parking and toll. •	Any meals apart from those included, TIPS, porter charges, personal expenses, camera/entrance/guide charges. •	Any other services which are not mentioned in package.